RIVA Audio are launching a brand new line of high-quality wireless speakers at IFA 2018, with Alexa functionality pouring out of its cones. 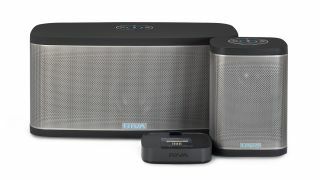 As the first third-party speakers to come with the full Amazon Alexa package built in, the RIVA Voice Series will form part of Amazon’s official line-up of Alexa speakers. A press release cited the new range as Amazon’s “official entry into the wireless speaker arena”. The RIVA CONCERT (£199/$199) is a standalone 50W speaker with an optional 20h battery pack and splash-resistant casing, for those wanting to take their music outside. The 200W RIVA STADIUM (£449/$449) is the bulkier option, with a 200W output you’ll need a plug socket for. As the first voice-controlled speakers from the audio specialists – who made their name with live music events for the likes of Led Zepellin and Jimi Hendrix – both RIVA devices come with the full range of Alexa capabilities. Aside from the main business of high-fidelity audio playback, that means you get calls and messages to other Alexa devices, Alexa skills, Spotify and Amazon Music compatibility, as well as more mundane tasks like managing shopping lists and asking the weather. Other neat features include a dedicated RIVA app, with a ‘push to talk’ function to use voice commands through your smartphone, as well as independent volume controls that distinguish between music playback and Alexa’s voice. Multi-room playback across various RIVA devices is set to follow at a later date. With Amazon having developed a wide range of Alexa-powered speakers for the home for different tastes and price points – from the miniature Echo Dot to the more premium Echo Plus – the next step was always going to be high-quality audio. There’s only so much bass you can get out of a standard Echo’s drivers, which are geared more toward casual listening and simple voice commands than serious audio fidelity. While there are already Alexa-compatible speakers out there, this is the first time Amazon has thrown their weight behind a particular range. Sonos was one of the first off the line, with both the Sonos One and Sonos Beam compatible with Alexa, though the smart assistant’s features are still being added and refined. Bose is also getting in on the Alexa action, with a dedicated smart speaker seeing release later this year.